Los Angeles, the City of Angels, includes the famous neighbourhood of Hollywood and is the second most populated city in the US. Its grid system of streets and freeways serving the busy city making it easy to find your way around, but avoid rush hour times! Try a walking tour or open top bus tour to get to know the city. Originally settled by 11 families in 1791 Los Angeles relied heavily on trade from overseas in order to grow. Originally part of the Spanish empire and then ceded to Mexican rule it became part of America in 1847. The El Pueblo monument and Heritage Square Museum show the vibrant history of the city and the 116 year old Angels Flight funicular traverses the steep Bunker Hill having originally opened in 1901 and recently reopened. A visit to La Brea Tar Pits & Museum will highlight the history of the City too. There are many tours showcasing the city such as Los Angeles Urban Adventures and many also serving to showcase the Hollywood area such as Starline Tours. Why not utilise our great prices for Go Los Angeles Card to explore what the city has to offer. Despite its many earthquakes and tremors, being situated on the Pacific Ring of Fire downtown Los Angeles has some tall buildings. Much of the cityscape of Los Angeles is low rise building, however a visit to the Skyspace Observation Deck on the 69th and 70th Floor of the US Bank Tower gives visitors a 360 degree view of the city. For those seeking a thrill try the Skyslide between the two floors, not for the faint hearted! With the film and entertainment industry being a big influence in Los Angeles it is no wonder that there are many film and entertainment attractions in the city. The kids will love a visit to Legoland California or Disney California and film attractions such as Warner Brothers Studio tours and Universal Studios Hollywood also feature on many must see lists. 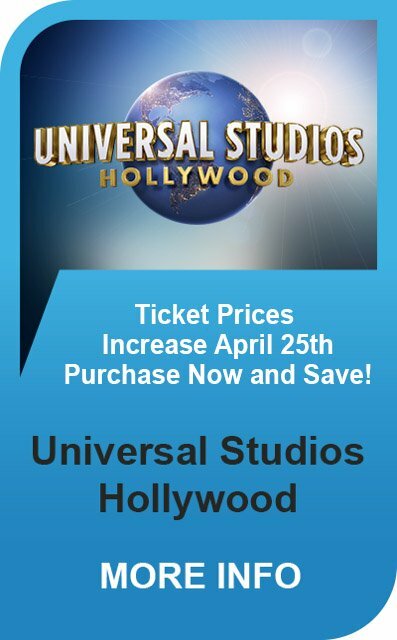 For a change of pace how about a visit to the Aquarium of the Pacific or have your photo taken with the stars at Madame Tussauds Hollywood or have dinner with Pirates at Buena Park after a day exploring nearby Knott’s Berry Farm. Walking the Santa Monica Pier, the shopping on Rodeo Drive and visiting the famous Venice Beach and Sunset Boulevard are all options for those on a tight budget.